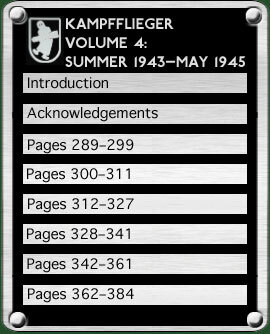 These pages contain various additions, updates and corrections to Kampfflieger Volume Four: Bombers of the Luftwaffe: Summer 1943–May 1945 (Classic Publications, Hersham, July 2005) ISBN 1 903223 50 4. This was a contribution to an existing series (Volumes 1 & 2 are by J. Richard Smith and Eddie J. Creek; Volume 3 by Dr. Alfred Price), with parameters set by the publisher, rather than a purely personal project. 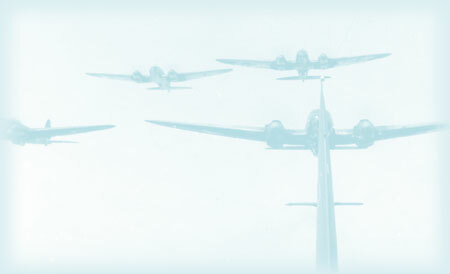 It was very interesting to research and write, nevertheless. The aim here is to offer some after-sales service for anyone who's bought the book and all the items here are cross-referenced to its page numbers. I've mostly omitted anything about the context and that's deliberate. Without the book you won't know how the material fits into the overall picture. If you're sufficiently interested, you could always buy a copy. If I find more material in the future that's relevant, then I'll try and include it in these pages. Two readers have posted contrasting reviews online but unlike them, you've found this web site.